At Unit18 Automotive, we don’t compromise on the parts we use on your vehicle. We believe that using genuine or OEM-grade parts is the best way to ensure both happy customers and vehicles that run soundly for mile after mile! To ensure you get the best quality parts for your car, we are authorised suppliers of a number of performance car parts and some of the most trusted names in the world of motorsport and vehicle tuning. Hardrace was founded in 1998 and they specialise in the design, manufacturing and marketing of reinforced chassis parts for racing and street cars. Hardrace use the latest materials and technology from performance in all their suspension components; from bushings to anti-dust pillow ball suspension arms. We are very proud to work alongside them and offer their products for our customers. Established in 2002, Ultra Racing Malaysia have specialised in the improvement of chassis handling and safety with their wide range of strut bars, anti-roll bars and lower bars. Ultra Racing products are used in many different motorsport classes over the world; including drifting, Time Attack and circuit racing. BC Racing are leading manufacturers of bespoke coilovers and suspensions springs for both street and circuit racing applications. Their products can be fitted to a host of vehicle makes and models and are very well respected in the world of performance car parts. V-MAXX Autosport is based in The Netherlands and offers a complete range of sport suspension and sport brake products for a wide array of vehicles. V-MAXX is known for offering outstanding value for money combined with robust, innovative design. 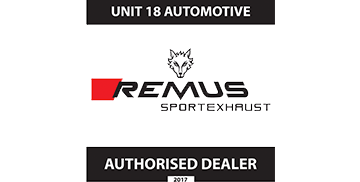 Remus GmbH are the world’s number one performance exhaust manufacturer exporting to more than 60 countries from their headquarters in the city of Bärnbach. Remus has a meticulous approach to development and use a purpose-built high tech acoustic room to test the sports sound of each exhaust on the car. We are honoured to be an authorised supplier! RacingLine is a performance part supplier based in Milton Keynes. They specialise in VW performance parts and upgrades. Go Fast Bits is an Australian parts dealer that develops new and innovative products year on year. AP Racing – The leading manufacturer when it comes to clutch systems and braking systems for both road and racing cars. Piper Performance Exhausts – One of the most established car exhaust providers in the UK with over 20 years experience. Helix Autosport – Make hand-made clutches for companies across the UK and around the world. Pipercross – With over 25 years experience in making air filters, Pipercross has been supplying the sport and domestic motoring industries. Ferodo – Manufacturing brake pads, brake discs, lined shoes and brake fluids for the domestic and racing industries. The PowerFlex company – With wide experience of automotive suspension and chassis systems using polyurethane manufacturing techniques.